For ADVANCE SALES by Aug. 1 (as we need time to order/print t-shirts - the deadline might be extended if it's possible), the cost is $15 per t-shirt, or $15.90 including 6% KY sales tax. SPS is also selling eclipse viewers (also called "eclipse glasses"). For ADVANCE SALES by Aug. 1, the cost is $3 per viewer (meaning $3.18 including KY 6% sales tax) if bought on their own, or $1 per viewer (or $1.06 including 6% KY sales tax) if each viewer is bought in combination with one t-shirt each. Therefore, one t-shirt and one eclipse viewer is $16.96, while two t-shirts and two eclipse viewers are $33.92 etc. See the eclipse viewer example below. ECLIPSE VIEWING GLASSES - WE ARE SOLD OUT! 1) At the SPS eclipse-viewing event at Mike Miller Park on Mon Aug. 21 before 1pm CDT. T-shirts and viewers will be on sale for a higher price on site (yet to be determined, but probably a few dollars more each), and supplies will be limited. 2) At the UofL Alumni Association - Nashville Chapter eclipse-viewing event at Sanders Ferry Park - Pavilion #8, Hendersonville TN, before 1pm CDT. See this website for details about eclipse-viewing. T-shirts and viewers will be on sale for a higher price on site (yet to be determined, but probably a few dollars more each), and supplies will be limited. 3) On the UofL Belknap Campus during the week of Aug. 14-18, during regular business hours, at a site to be determined and announced on the SPS eclipse Facebook page. Orders can currently be made by check. Eventually, we would like to have them made via PayPal and credit card, but we're not quite there yet. Please send a check payable to "Society of Physics Students, Univ. of Louisville" for the amount corresponding to your order. Be sure to use the amount including the 6% sales tax. 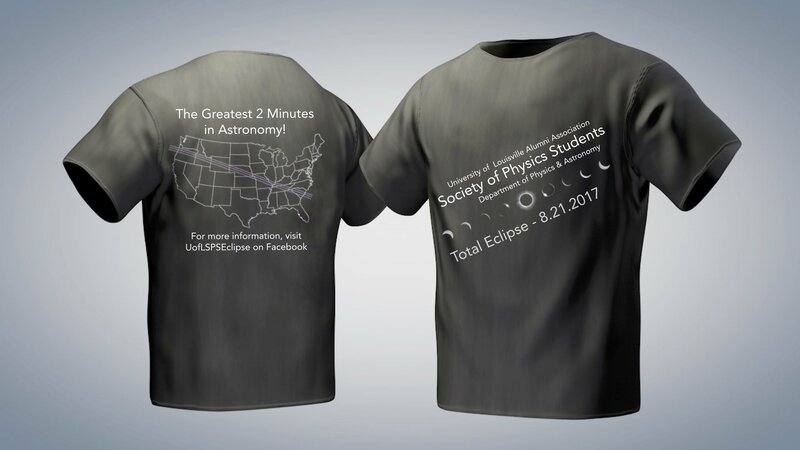 Please indicate the number of shirts, the sizes and colors of each, plus the number of eclipse viewers. its Paypal account to its Facebook page. Please watch this page for developments. SPS would welcome help from any alumni who could provide mail-order service for alumni who cannot pick them up. Although the path of totality is 3000 miles long and 70 miles wide, the eclipse viewers are useful over a much wider area as the partial eclipse will be visible from across the continental US. Shipping and handling/labor would be appropriately added on to cover costs. Where will you pick it up?